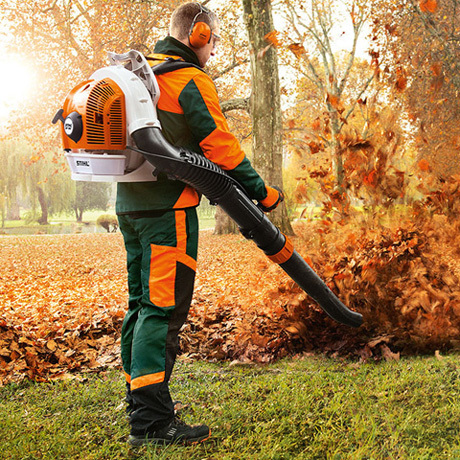 Autumn is time to collect leaves and lawns from "clean", especially for professionals and for those who work in large area is important when choosing a suitable blower to easily free up parks, gardens, avenues and green areas from leaves, debris cuts and other waste. For this GardenTV he wanted to ask companies to present their top products for intensive or professional use for autumn 2016. In this article we review both the combustion models, both increasingly popular products lithium, on which many companies are investing in terms of innovations and improvements, will then present a broad overview of the models currently on the market. All companies were asked to indicate the new for 2016 or their "bestseller", the characteristics of the blower, and then the strength of the competition. 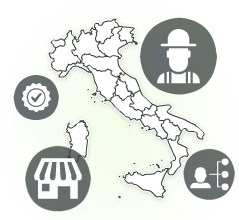 Two proposals of Cifarelli range explains Rosalba Zagara, marketing & export. The BL6S is a muted blower for cleaning large areas, roads, tourist areas, parks, golf club, where a minimum sound impact is required, to give operators the opportunity to also work at night and no early morning disturbance. Such characteristic is obtained thanks to the particular conformation of the patented fan and the closure in a double coverage in sound absorbing material. The result is approximately 64 dB to 15 m.
Another strength is the exhaust system, that produces no emissions at head height and use it therefore possible even in the midst of people. The model BL1200 is instead characterized by the ability to develop a large volume of air at high speed and is suitable for intensive use and long lasting, thanks to the motor to two times by 5 hp. Low weight, low vibration, adjustable handle without tools and positioning of the shoulder straps make it an ideal model for gardening professionals. Il modello BL1200 si contraddistingue invece per la capacità di sviluppare un grande volume di aria ad alta velocità ed è adatto a usi intensivi e di lunga durata, grazie al motore a due tempi da 5 hp. Peso ridotto, bassissime vibrazioni, impugnatura regolabile senza attrezzi e posizionamento degli spallacci lo rendono un modello ideale per i professionisti del giardinaggio. 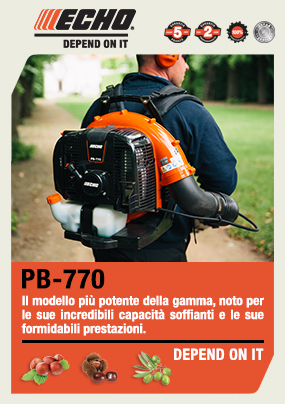 The most powerful model in the Echo backpack blower range is called PB770 "is known - explain from the office Cormik marketing - for its amazing ability blowers and its formidable performance." This model fits the needs of professionals, for particularly heavy cleaning jobs even in large areas. 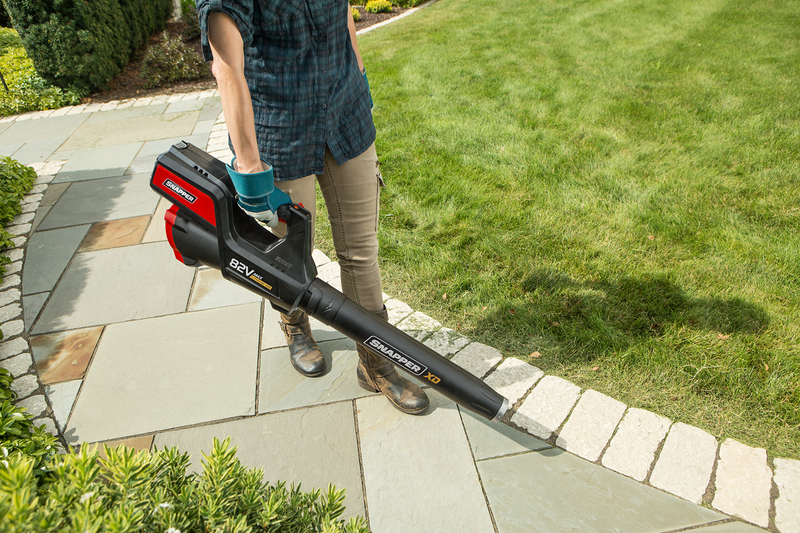 Designed for extended use, this blower combines power and comfort, thanks to the anti-vibration system and the ventilated back, designed for the comfort of the operator. Also has the exclusive Posi-Loc system. Both the Efco brand both for Oleo-Mac, Emak has a abetted blower model that allows to work on large sizes. 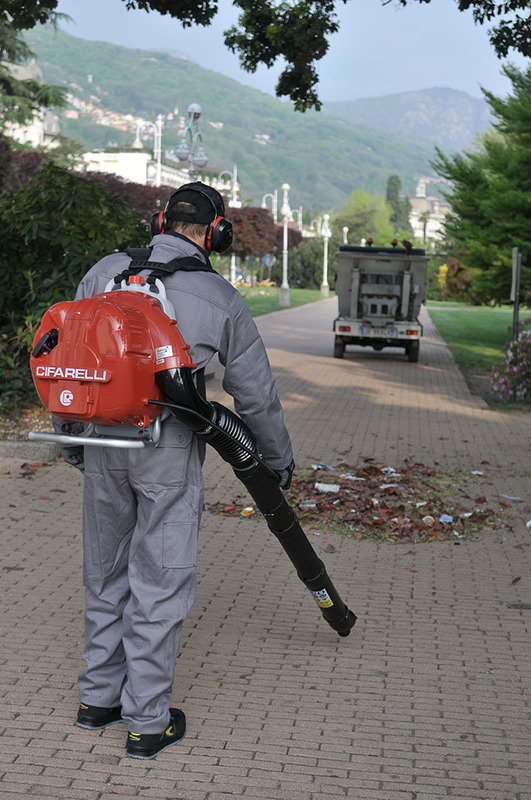 The models SA 2062 Efco and BV162 Oleo-Mac are shoulder blowers ideal for cleaning jobs in both urban areas (stadiums, parks and flower beds) and in rural areas (squares, courtyards) also useful for moving and compacting fruit or any other crop just fall from the plant. The weight content, the air velocity and the volume of flow exiting make them convenient tools, powerful and performing at the same time, while the noise level is very low. The accelerator is placed directly on the spout, ergonomically designed to ensure maximum comfort. The large air filter paper, with a sleeve connected to carburettor rubber, ensures maximum efficiency of the machine, even when used for long periods in dusty environments. The abetted frame is extremely light, blown propylene. .
Like every year even this fall Husqvarna offers several models, some for the demanding home, others for the professional who requires power, light weight, ergonomics, durability and extraordinary balance," says Giuseppe De Gobbi, division responsible Husqvarna. For those who need to handle large areas and therefore has chosen to opt for a model with backpack, Husqvarna offers its BT 530 which combines a weight of 6.7 kg X-Torq engine, which reduces the consumption of fuel up to 20% and exhaust emissions up to 75%. Also it has a comfortable strap and intuitive controls. 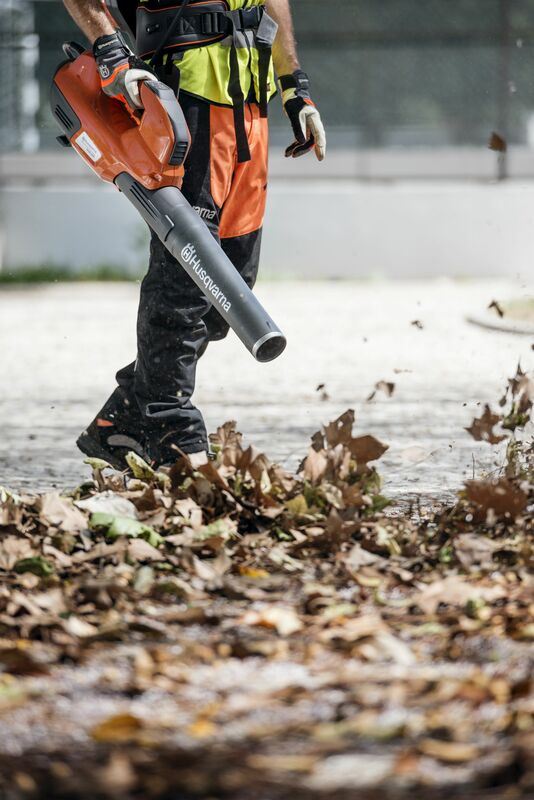 The model BR700 of Stihl is an extremely powerful professional blower, blowing device with adjustable length. It is characterized by considerable blower strength and reduced weight, and is optimal for the removal of leaves and weeds on large surfaces. It features anti-vibration system, which reduces vibrations to a minimum, thus ensuring great working comfort even in the house of prolonged use. The engine 4-Mix combines, as explained by the company, the engine benefits 2- and 4-stroke: reduced emissions, outstanding performance and pleasant noise. The blower mounts a handle multifunction with all the commands for the control of the integrated motor. Turning instead to the battery products, Bluebird presents the new blower R3, equipped with powerful battery Samsung to the lithium cell (40 V - 2.5 A / h), able to guarantee up to 55 minutes of continuous work. You can also adjust the power of the air outlet, inserting the turbo option. "The lightness of the product, ease of use and excellent performance - explains Roberto Tribbia, commercial office - make R3 a very attractive machine for hobby customers who want the advantages of the electric motor, without the ' running cables and extension cords. The extremely competitive price finally puts this product in the range accessible to the general public of the garden, not only to the professionals. 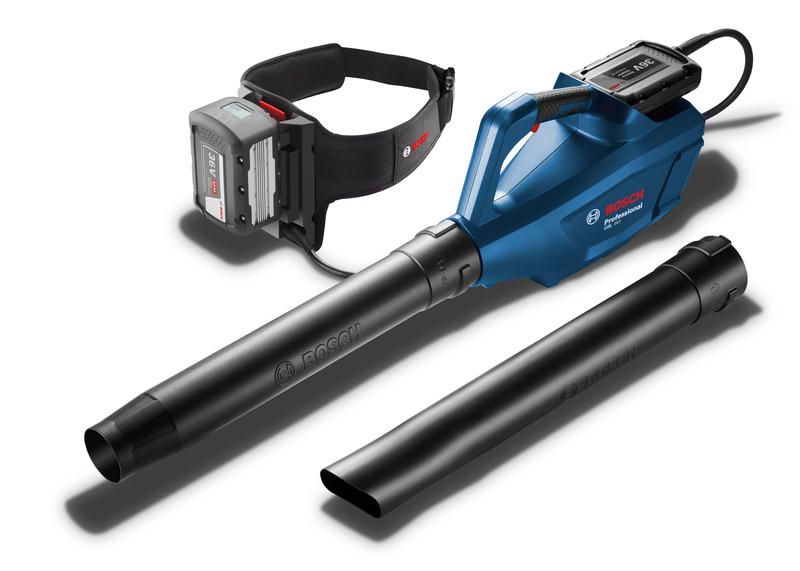 Bosch has also prepared a novelty for autumn 2016: the professional blower and battery GBL 860, a product intended to professionals and professional gardeners, but even the most demanding home. "The main features of this product - says Massimiliano Raguso, regional product manager for professional gardening Bosch - are compactness, low noise, power." 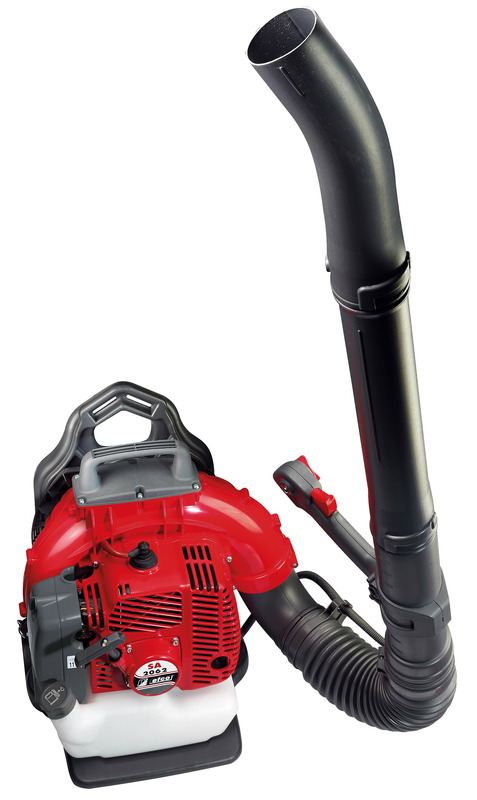 In your opinion what are the advantages and the strengths of this blower than competitive models? The pluses are definitely the noise and the particular operating system that automatically brings the arm and the operator's wrist in the optimum position of use, allowing you to work longer without any effort. 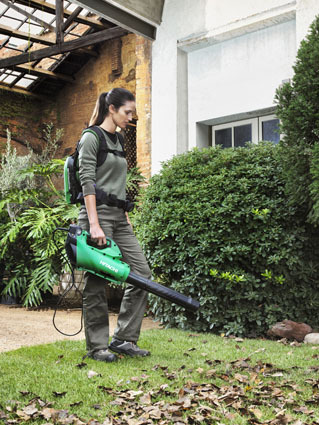 As part of cordless blowers for professional use, Hitachi faces fall with the RB36DL. Among the peculiarities, the ability to produce a volume of air equal to a combustion machine, with the advantage of being much quieter, to weigh considerably less, not to produce vibration on the hand and the operator's arm. "The high performance - adds Maurizio Fiorin, ope manager HFI - are detrimental to energy consumption, so the machine is usually used in combination with the battery pack BL36200 from 21ah, capable of providing autonomy that swings from about 3.5 hours to 1.5 hours depending on the power that is used. The novelty is that soon will be available from the battery Slide 6Ah that will be adaptable to the blower, and be able to provide an autonomy of 1 hour and 20 minutes." The brushless motor, the air volume, the lightness, the possibility of use in battery pack and battery Slide, the noise. The new Husqvarna is called instead 536LiBX: "a blower to a battery pack for the professional who intends to operate in noise sensitive areas and with total respect for the environment, whether they are outdoors as within stadiums and deposits ", he explains Giuseppe De Gobbi, division responsible Husqvarna. Single harness included, 2.8 kg (without battery) and 12.2 m³ / min air flow in housing, you start with a simple touch on the keyboard, while the cruise control system allows you to adjust the fan speed and leave everything time to focus on the removal of leaves, debris and waste. The blower Husqvarna 536LiBX also has a Boost mode that gives even more power in case of need. "The lightness and quietness, but also its battery which like all Husqvarna battery is designed to deliver the maximum power until it is completely discharged and to be heavily used, in this case Delepine 536LiBX the battery pack is characterized by capacity for almost an entire working day. The belt can also be adjusted according to the user's height and feels just on your back and shoulders. The adjustable back plate follows the movements of the shoulders, thus allowing to work in a comfortable and efficient. The LED display adapter allows you to clearly see the power / charge status in percent, while the cells with high performance and battery monitoring make it an ideal machine for professional use. Finally, has a sophisticated security system, which protects batteries and user in critical situations, "says Giuseppe De Gobbi, division responsible Husqvarna. As regards the proposal of blowers for autumn 2016, Pellenc Italy has decided to move ahead, presenting the new Airion2early as February, as they explain Antonio Isa, head of service and logistical assistance and Marco Guarino, marketing and communications: "a natural evolution of Airion predecessor, our new blower went to further develop the strengths that for years characterized the Pellenc products and improved the already excellent performance the previous model, "he told to GardenTV Marco Guarino, marketing and communications. "The range of Pellenc tools is famously addressed to a professional audience, which makes extensive use of tools but at the same time has a special focus on health and environment. In the case of Airion2 the main target are the gardeners and operators of the public areas, so all those who daily do valuable work to maintain clean streets and courtyards. Our blower is particularly suitable for road cleaning as a support for sweeping machines. Airion2 offers a great opportunity to be used essentially anywhere and above all without sight of the time limits almost no noise produced by 'tool; 92 decibel output, with only 79 perceived by the operator. 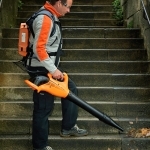 Also just think of the substantial difference in noise and odor produced by the classic blowers with internal combustion engines against technology of the Pellenc range that instead harnesses the power of direct electric motors powered by lithium-ion managed by an electronic card to patent Pellenc "says Antonio d'Isa. What are the characteristics of this blower? "Just a quick look at the data sheet (attached) of Airion2 to realize the potential of the blower fielded by Pellenc - says Marco Guarino - a real weight of only 2.55 kg, cable included, and a maximum power output of 940W damage that the idea of the work that has been played by Pellenc engineers to develop Airion2. Helped also by a range of up to 5 hours thanks to Pellenc Battery ULiB 1100 Airion2 is thus the ideal meeting point between lightness, power and durability." In your opinion what are the advantages and the strength of this blower than competitive models? "As said the main strength of this blower is the output power 940W, that make it superior to any other equivalent blower or battery to the internal combustion engine: our nominal power is equivalent to the real power, working in this case the motor in direct contact with the turbine without any reference corner. Further strength of Airion2 is the ergonomics of the machine, due to the positioning of the turbine inside the tool body. The fact Pellenc engineers have worked hard managing to reach a perfect balance between the thrust of the turbine and the air outlet. The fact the final part of the blower is turned so as to make optimum the point of exit out of the jet, in such a way that the operator is not forced to balance it with the strength; Airion2 in this way will remain perfectly balanced even during its use at maximum power. With these features, combined with the already stressed zero gas emissions, and noise abatement, Airion2 can only be considered at the top for the supply side of the blowers for autumn 2016 ", he concludes Antonio d'Isa. 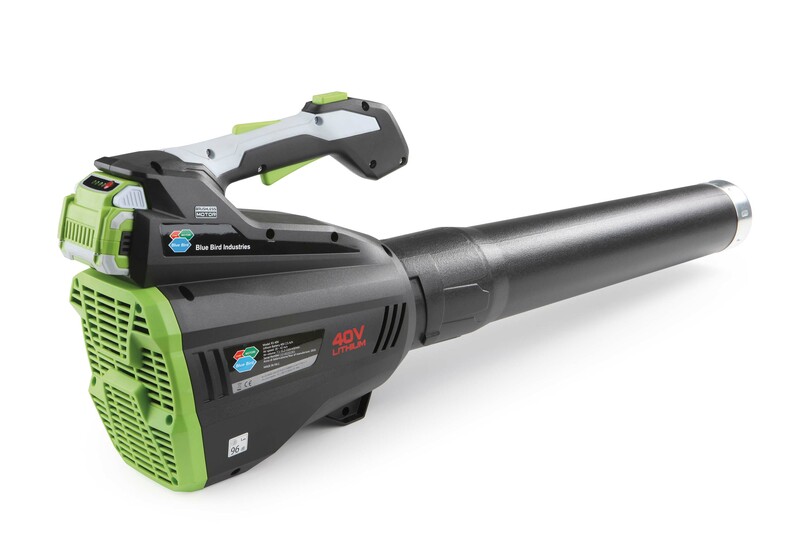 Sabart exclusively distributes for Italy range Cordless Always ReadyTM of Oregon, with 36V battery PowerNowTM lithium-ion battery, which is also part of the blower BL300. brushless motor, variable speed with the addition of the "Turbo" button to reach the maximum power, range up to 90 minutes at low speed: these are the main characteristics that distinguish it, as pointed out by the Sabart marketing manager, Ruggero Cavatorta. 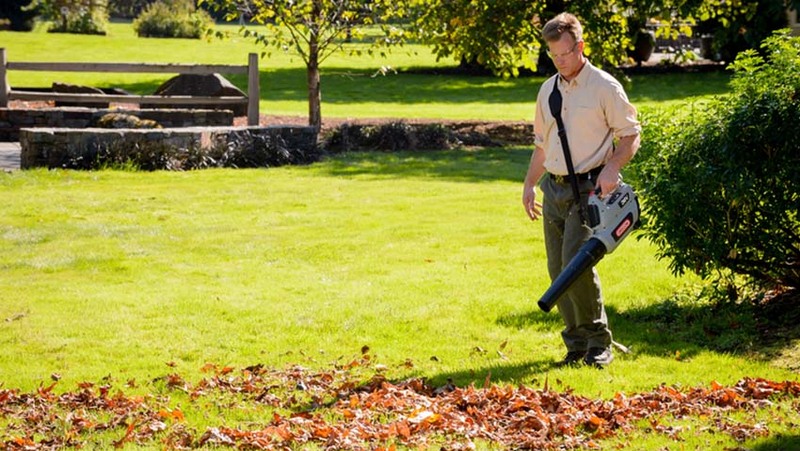 "The high performance and low maintenance make the blower BL 300 ideal for both professionals and for hobbyists. The ergonomic design, the perfect balance, low weight (3.8 kg including battery) and conveniently supplied shoulder strap make it a comfortable working tool and easy to use, "says Cavatorta. 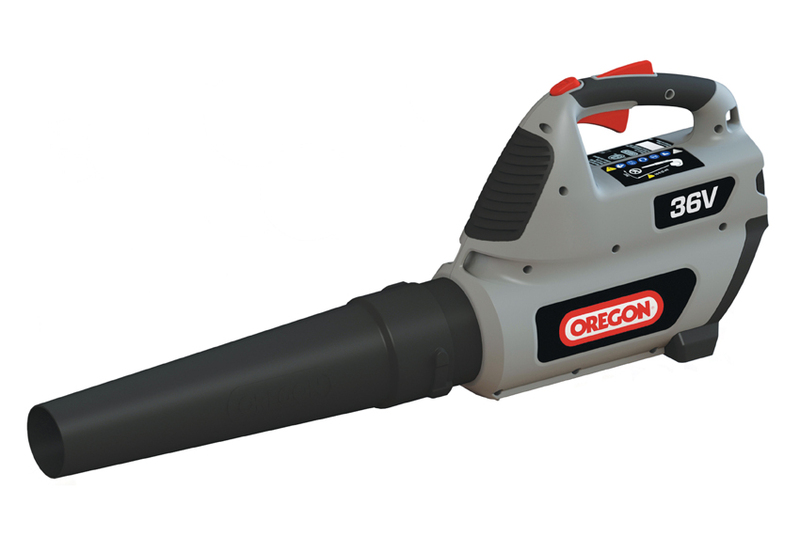 "Compared to the blowers of the battery-powered competition, the performance of the blower BL 300 are placed at the top of its class: the volume of air max is equal to 841 mc / h and air max speed 212 km / h. These numbers position the Oregon blower as a viable alternative to the internal combustion engine models. 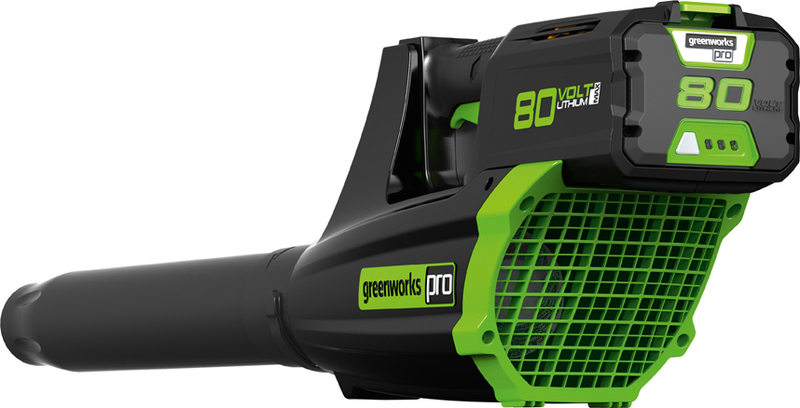 For fall we as a focus for specialist dealers the most powerful handheld blower battery on the market today: the GreenworksPro 80 volts. Performance as a good 32cc combustion but zero environmental impact, "says Federico Forno, sales manager Sabre Italy. The blower is intended to alert users to the preservation of the environment, which require prolonged use respecting the maximum possible noise but also eager to save money, because with today's technology at our disposal, we can guarantee identical performance if not more than one engine combustion for more than 1000 charge nullifying the costs of maintenance cycles. "A product battery is always ready for use. Batteries with technology at 80 Volts allow longer life than traditional trading lower voltage or, at equal length, more power due to lower impedances, "says Federico Forno, sales manager Sabre Italy. "Always press a button was easier than starting an internal combustion engine, from today, with Pro Greenworks 80V technology, more recharge a 2Ah battery requires only 25 min and provides a range of 30 min of work with the yield of a thermal 32cc, which allows in practice to work in a continuous cycle with two batteries sun. This factor was the critical stage for manufacturers of low-voltage batteries, now that the time exceeds the recharge time to think for continuous use with most batteries is more easy and convenient for every type of user. Zero emissions without coming to any performance compromise. Reduction of up to 95% of operating costs, no costs to the mixture and thanks to the brushless motor longevity of performance without any maintenance. Batteries and charger are compatible with the entire Greenworks Pro "range, the new sales manager Sabre Italia. Fiaba present at EIMA 2016, the new line of Snapper XD 82 Volt products with lithium batteries from 2Ah and 4Ah Briggs & Stratton. "In particular - says Diego Dalla Vecchia - the blower 82V model SXDBL82K, which offers unique features such as an air speed of up to 210 Km / h, d 'air delivery 15.5 m³ / min, variable throttle with cruise control, steel toe cap on the blow pipe terminal for greater wear resistance". The weight content, the air velocity and the volume of flow exiting make them convenient tools, powerful and performing at the same time, while the noise level is very low. The accelerator is placed directly on the spout, ergonomically designed to ensure maximum comfort. The large air filter paper, with a sleeve connected to carburettor rubber, ensures maximum efficiency of the machine, even when used for long periods in dusty environments. The abetted frame is extremely light, blown propylene.